I'm Not Skinny: I won, I won, I won! Few things are as exciting as getting an email declaring that you've won something. Then there is the whole process of verifying that it is true, and you're not being tricked. Well I'm not being tricked I just won a fantastic prize pack. UMM YAY! 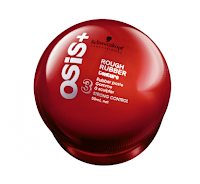 You may recall my post about how fantastic Rough Rubber by Schwarzkopf Professional OSiS+ was. Well that was part of a brand challenge for the Influenster #SpringVoxBox I'd received. I did well enough on my challenges to score this awesome prize pack. I'm so excited! I loved Rough Rubber and am stoked to try out these other products. Thanks Influenster and Schwarzkopf for this amazing prize pack! Congratulations!! I get excited when I when great prizes also. I don't typically win. Which makes this sweeter! I'm an excitable person. Congratulations!! It is so nice to win something but even more to get praise for a job well done from the company!! Congratulations, your hard work paid off! Congratulations! That is awesome that you won, especially since you seemed to really like the product. I'm glad they acknowledged your effort too. Congratulations on your win! I love winning too it is a great feeling. I hope you review your winnings! I would love to hear about the other products. I love getting emails that tell me I've won something!! Congratulation!